Instrumentation: Drums, percussion, bass, guitars (electric and acoustic), acoustic grand piano, Hammond B3, synths, male lead vocal, harmony vocals. A big old prog rock track recorded at Abbey Road. Produced by Alan Parsons in the very studio where he engineered Pink Floyd's Dark Side Of The Moon, Belgian artists Fish On Friday are one of the country's leading prog rock outfits with a string of commercially successful albums to their credit. This song, appearing under the title In The Key Of Silence appears on their 2017 album A Quiet Life. Fish On Friday is led by producer and multi-instrumentalist Frank Van Bogaert. In addition to his long time bandmate William Becker, Frank is joined by new band member Nick Beggs - himself a high profile bass player who came to fame with popsters Kajagoogoo in the 1980s and who went on to headier work with Ellis Beggs & Howard, Steven Wilson, and Steve Hackett. The line up is completed by British session player John Mitchell from It Bites and several other notable prog rock outfits. 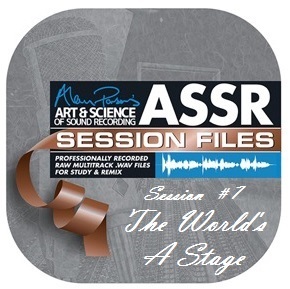 The World's A Stage is if not a magnum opus then certainly a significans opus running at around sevens minutes, with multiple sections and time signatures and bristling with 61 tracks of recorded material. Marcus Weymaere's drumming is a treat - plus you can really get a feel for Abbey Road's 'drum sound' as this was recorded in the main live room - and the rhythm section of Weymaere and Beggs is an impressive one. Built on top of this solid foundation is a colorful spread of keyboard and guitar parts: acoustic grand piano, B3, and a collection of synth strings from a Yamaha Motif and plug-ins (Matrix 12, Solina, Prophet-5 etc). John Mitchell's guitar work is very tasty, from acoustic guitar and 12-string to electric power chords, FX tracks and of course a guitar solo. The track has a full compliment of crisply delivered vocals - both harmonies and backgrounds. If you've ever wondered what it would be like to work on a complex prog rock song like they used to make 'back in the day', with a fast moving and dense arrangement and multiple sections, here's your chance to find out. Remixers will need patience and stamina but this dense and complex track offers great rewards.